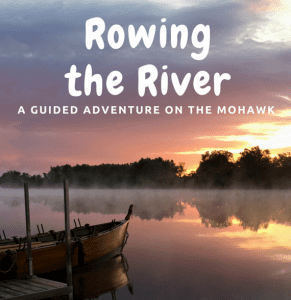 This summer, the Schenectady County Historical Society is set to present Rowing the River and Kayak Through History: two series of hands-on boat programs that enable participants to see and learn about the Mohawk River in person. Whether through the wooden oars of reproduction bateaux, or through sleek, modern kayak paddles, visitors can experience everything the Mohawk River has to offer. Attendees will navigate through forested islands and narrow inlets and learn about the earliest Schenectady history to the most modern riverside developments. Rowing the River programs have been set for Saturday, August 4; Saturday, Sept. 22; and Saturday, Oct. 6, all beginning at 10 am at Mabee Farm. Travel back to the 1700s when the mighty Mohawk was the gateway to the West. Guides will take attendees on reproduction boats out for a 2 hour rowing session on the Mohawk. Price is $15 for kids, $20 for adults. Sponsored by the Erie Canalway National Heritage Corridor. Kayak Through History programs have been set for Saturday, August 11 at 10 am, 12 pm, 2 pm, and Wednesday, August 15 at 6pm. Launches are to be determined. Audrey Egleston of Amsterdam’s Down by the River Tours will lead a kayak tour of the Mohawk, looking at Schenectady’s history. $20 for rentals, or $10 to BYOB (bring your own boat).